Tuesday, I had a $200 Italian dinner with my old boss (he paid) followed by $5 Hurricanes at a dive bar in Times Square. Good times. 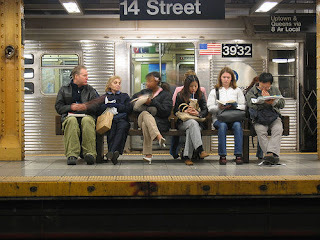 And just as good, on my way to the restaurant, I was on the N train coming from the East Side into midtown, and there were - and I am not exaggerating - people reading Asian, Spanish, Indian, Russian (maybe Polish, I couldn't tell) and British newspapers. And a bunch of other folks reading books - serious hardcovers and trashy paperbacks. Does any other city read as much as this one? Granted, most people out there have to drive while they commute so they can't read. But what an amazing - it's cliche, but true - melting pot the city is. And this, of course, is the great fear of those clowns you hear out there in East Bumfuck at those "town hall meetings" screaming, "I want my country back." It ain't the 1950's any more, goober. Get over it. Yup, "I don't want a black president any more" is what they are secretly saying. They just cant be so blatant.